We’re just back from 3 marvelous days of birthday camping (thank you heartily for your birthday wishes!). It’s funny how camping is like this schizophrenic mix of hard work and then so much leisure time you can get a little good-naturedly bored. You might spend half an hour cartoonishly scouring caked-on tortillas from your cast iron with a branch of stiff-needled spruce, all the while fending off curious dogs and children. And then the next 2 hours you’re in your camp chair listening to the beautiful sounds of slide guitar and chatting it up with dear ones, the only necessary work being periodically moving your chair into the shade. Which is to say that last night, after shoving our dirt-dredged clothes in the washer, unloading the cooler and washing our grubby, gnat-bit bodies, we all fell right to sleep. Dan and I couldn’t even stay up late enough to lock the chickens in (they file into the hen house right at sundown). 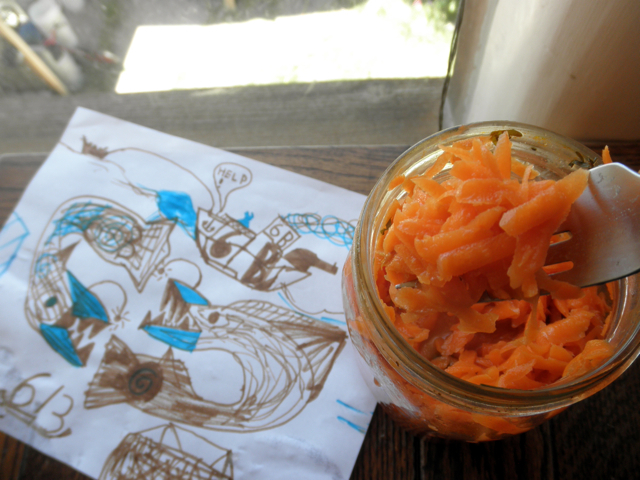 And now, by the grace of coffee, I am introducing to you the easiest vegetable ferment ever. These cultured carrots are a starter ferment, a gateway that may lead to wild escapades in lacto-fermented pickles and coconut kefir water. Fermented ginger carrots are sweet and mild, something you could serve your skeptical father-in-law without even mentioning the word fermentation (when my parents were recently visiting, every night I made two salads: a tame, all-lettuce salad for my dad and the kids, and a wild romp of arugula, bok choi, chard, beet greens and spinach for me, Dan and my mom). And, despite the fact that at our 2nd night campfire, many of us drank ginger tea (ginger tea! hangover-free! ), I still feel like I’ve been scoured with a spruce-needle branch, and so I’m going to skip clever intros and get right to the recipe. But, I will say that when I make fermented ginger carrots, it is so good (sweet-sour-gingery), that a quart disappears fast and Rose will often choose cultured carrots for her vegetable. Grate carrots and ginger, place in bowl. Toss grated carrots and ginger with salt and then let sit for 15 minutes, where the salt will begin to osmotically (take that 11th grade remedial-chemistry!) draw out water from the carrots. 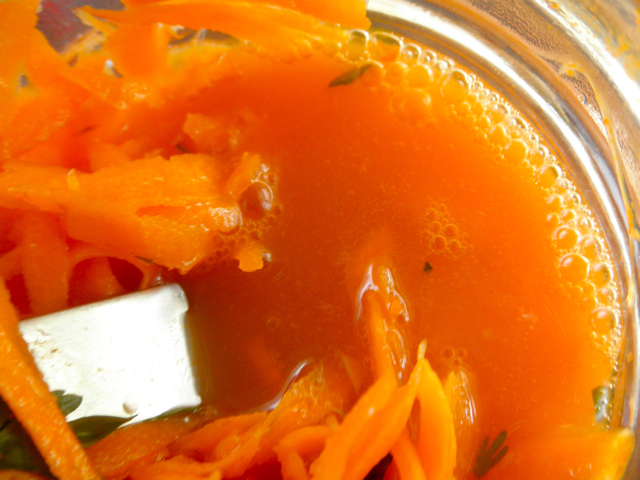 Place 1 cup carrots in a blender or food processor with the 1/2 cup water and blend for a minute (this breaks down the cell walls of the carrots and introduces the lactobacilli to the mix). 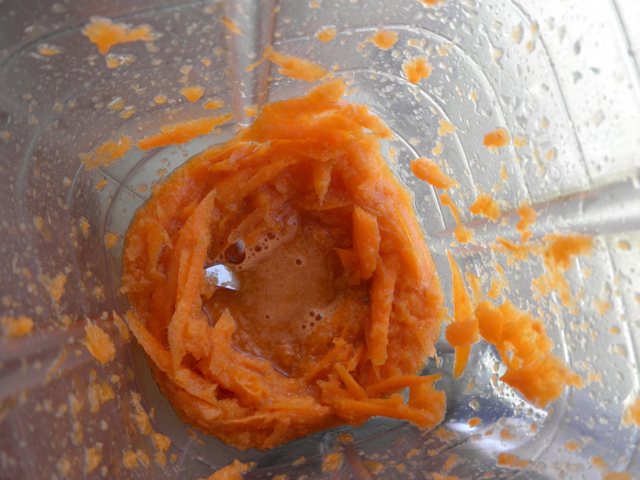 Next, stuff (and I mean stuff), the carrot, ginger, salt mix plus the carrots/water from your blender into a quart jar. Use a fork to push the carrots down towards the bottom, allowing the liquid to penetrate all levels. Keep pushing until the carrots are submerged and there’s an inch of liquid on top. Cap jar and let sit for 3-7 days then transfer to fridge. 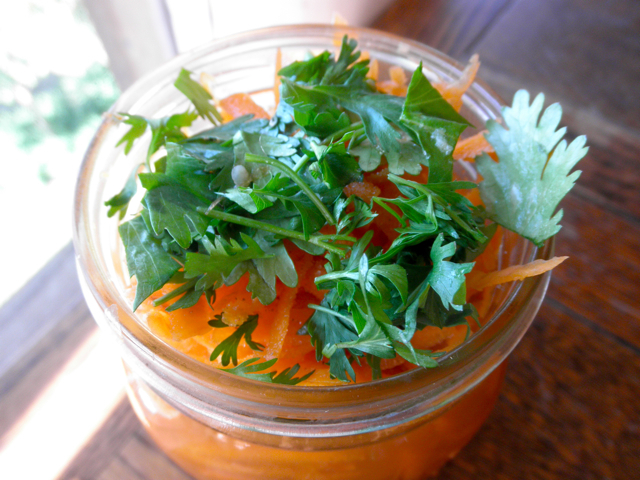 The warmer your house temp, the faster your carrots will ferment. Check for taste after 3 days. I like mine sour enough to sit for 7 days. The grating takes a very long time if you’re five. Lethargy, boredom and anger may set in. Adding the salt is more exciting. 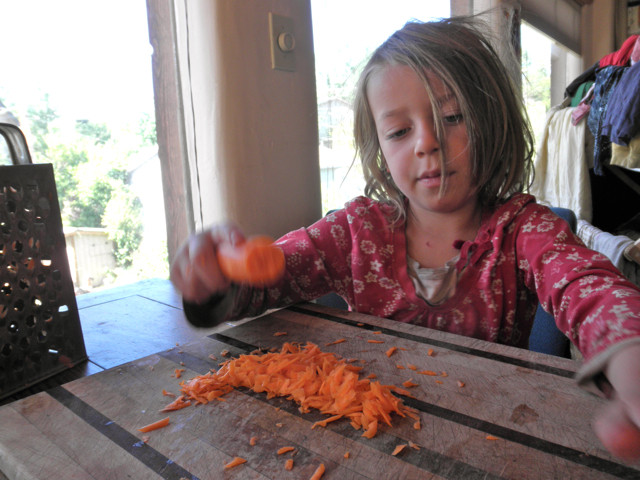 Not as exciting as squeezing the salted carrots in hopes of facilitating the osmotic process (osmotic process! how do you like that?) This step is optional. The blender step is really helpful to kickstart the fermentation. 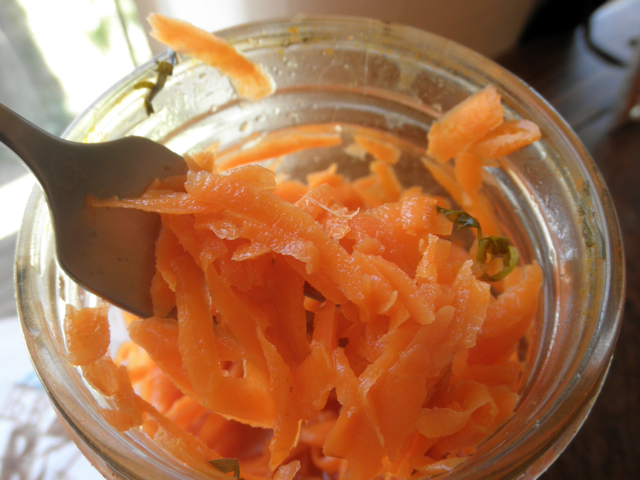 Stuff those carrots deep in the jar. This is what it should look like before you cap it. This is an anaerobic ferment, all the carrots need to be completely submerged. You can place a bag of water or a smaller jar of water on top of the carrots to weight them and keep the carrots submerged, but I usually just use a fork to push the carrots down once each day. If you don’t use a weight, screw the lid on the jar and let it sit in a warm place, but out of the sun, for 3-7 days. I added some fresh cilantro because I’m wild and crazy and forty. 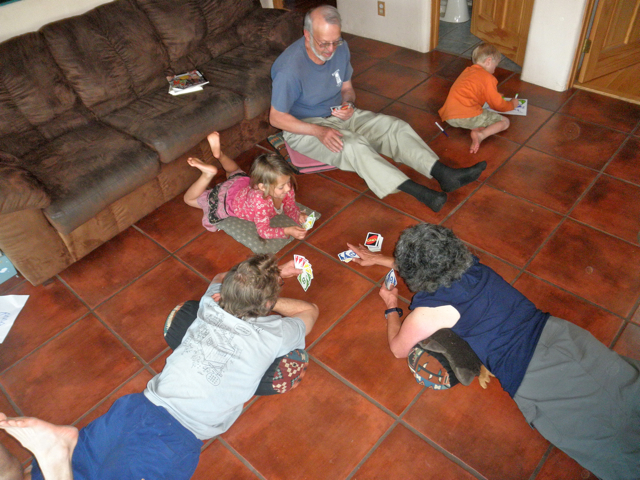 Then, play a little UNO to pass the time, if you don’t mind being trounced by Rose. Col is now spending most of his inside time drawing sharks and submarines and ships and an occasional hybrid: barracuda-toothed carnivorous squirrels. Keep watch for bubbling and don’t be too bashful to exclaim loudly to your family how badass you are for harnessing naturally occurring bacteria to improve the health and digestibility of a simple carrot. Oh, how I love this stuff. Enjoy! Yum! But I’m soooo lazy and also pressed (ha! get it?) for time. I just want to get to the eating part. Too bad we aren’t neighbors and I could trade family yoga (or therapy! or a hybrid!) for carrots. Super nice photos of all that orange-y goodness (and that 5 year old is pretty photgenic, too). Hope you are enjoying the post-birthday-ness! That is too bad we’re not neighbors, because I could use therapy *and* yoga instruction! “by the grace of coffee”! Ha! You crack me up momma! And you’ve won me over….gasp…tomorrow this WILL be happening in my kitchen. I’ll be sure to report back! Eeeek! Fermentation sounds scary, I know. But this recipe, I promise: easy peasy. And yes, do report back. Fermentation is exactly what I had on my mind, but it included cherries that had been pitted and left out of the fridge and now have a fermented smell…and I hope we did not waste a huge bowl of our sweet cherries! any ideas? Hmmm. We’re such unashamed and frugal rescuers of food that I hesitate to give advice (we recently put a mason jar of pinto beans in the freezer and 4 days later discovered the jar broke. Dan insisted that it was a clean break, no glass shards, so we defrosted it and ate the beans, which seemed a little sketchy), but you could try cooking off the funk and then making a crisp or something desserty. Very fun. I love the part about not being bashful. Rachel, you mentioned coconut kefir water. Is this a realy recipe you have in your head? If yes, would you share it? Or is it an idea for wild experimentation? I’ll be 41 in a few days. I rather like this getting older; I feel like I am better at life each year. Looking forward to 50, such a cool number. Oh, how I love and enjoy your stuff ! This illustrated “carrot, girl and family interlude” story looks quite like a children’s book favorite to me :o) As palatable as the fermented ginger orange thing. And Col’s creatures are fantabulous ! For reals. Looks delicious! Can you tell me how long they “keep” after the 3-7 day fermenting process? Do they just continue fermenting??? Thanks!!!! Good question! My sauerkraut has lasted in the fridge from last NOVEMBER! So, I think it’s safe to say, at least 2 months. I love how you describe camping. It’s so right on – the peak and valley of being in the peaks and valleys. 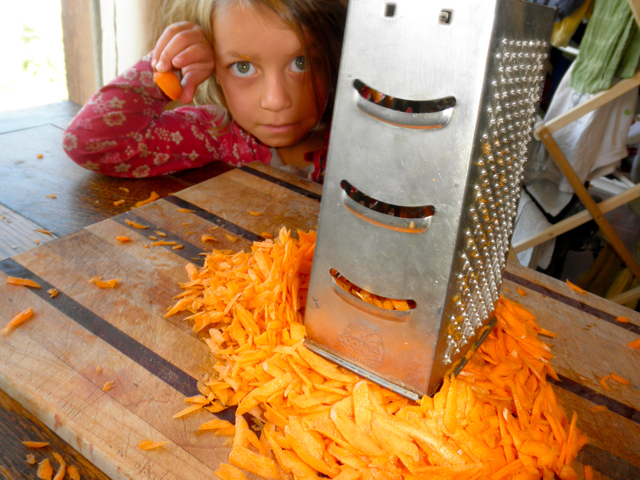 And I nod my head with the look on ms. carrot grater and the statement that it takes a long time if you’re five. Good stuff here, my friend. We love carrots. This may get me to try this whole fermenting thing. See? Carrots are the gateway! Go forth and ferment! Col’s drawing reminds me of Native Alaskan art work. I think it is beautiful. Oh I’m going to try this. Also, thanks to our newly cultivated garden, we now have a fresh supply of tender dandelion greens. Tried your dandy pesto and LOVED it. Dumped some into a frittata for lunch then pizza for dinner. YUM. Sweet! Thanks for reporting back! This recipe is too salty for me. I think next time I’ll reduce the salt to two tsp and see if that’s any better. I also use a lower amount of salt for my other ferments too but I used your complete recipe. After tasting it I realise it’s far too salty for me so I’ll have to modify it. Thank you for this. It’s quite yummy. Darn. Maybe you can water it down a little, or add more carrots? I’m a bit scared to do anything to it right now. I know I can run it under the water before I eat it to lower the sodium. Next time though I’l try 2 tsps and no salt added to the 1/2 cup of water or so. If I do add any it will be around 1/4 tsp. Just to give you an idea. I make 5 lbs of sauerkraut at a time and I add about 1 TB to a batch of this size. The whole point of the salt is to act as a preservative so the vegetables can ferment without rotting. You only need the very minimum to achieve the best results. So, two teaspoons for five to six cups is plenty. So with me using 1/2 cup of water after putting the mixture in with the rest of my carrots the water is only going up about 1/4 of the jar, definitely not reaching the top of the jar. Any suggestions on what to do in this instance? I blended 1 cup of carrots with 1/2 cup water. 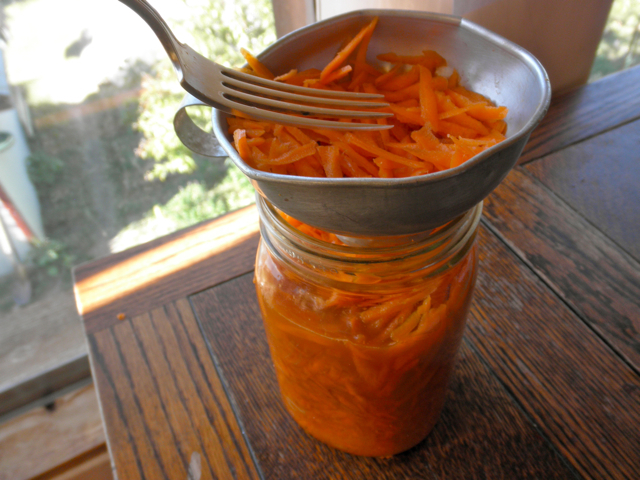 Press the carrots down hard in the jar with a fork or wooden spoon. And then press some more. Add more water if you need to. Okay, I don’t understand why you would mess up perfectly good carrots this way. Please enlighten me. What’s wrong with just “carrots”? I hope you’ll consider entering it in the Saturday Round-Up, the new blog hop over at A Joyful Mother! Rachel- I made this recipe from the NT cookbook because my family adores ginger. I left it out for 5 days, but my daughter was exited to try it and when your 17YO is excited to try anything, you go along with it. Unfortunately, it was awful! I thought it was just her being a teenager, but no. It sucked. 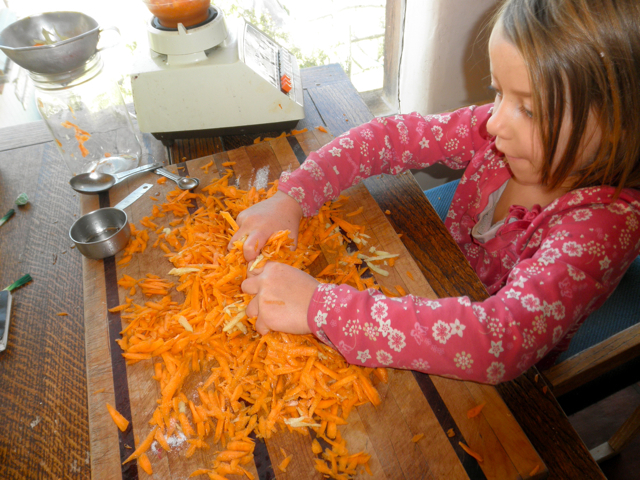 I hate to waste them after shredding all those darn carrots without a food processor. Any ideas? I thought about draining them and adding more water and salt and letting them sit again for a few days. My husband suggested a pinch of sugar. I want to save carrots, I just don’t know how! Thanks! UPDATE- I wanted to come back on here and not only update my last comment but correct it as well. Rachel was nice enough to email me and help me fix my carrots after I left the last comment. Let me be clear, her recipe was tasty. The reason I said it sucked initially was because I made it too, too gingery. We love ginger in my house, but it knocked our socks off! Rachel had me drain off most of the liquid, make more brine, and then have it sit out for a few days more. Once I did that, it was delicious and the whole family is enjoying it. I will definitely make it again, but next time use half the ginger I did last time -I did go a bit overboard thinking more was better…not true in a ferment…things get stronger!! 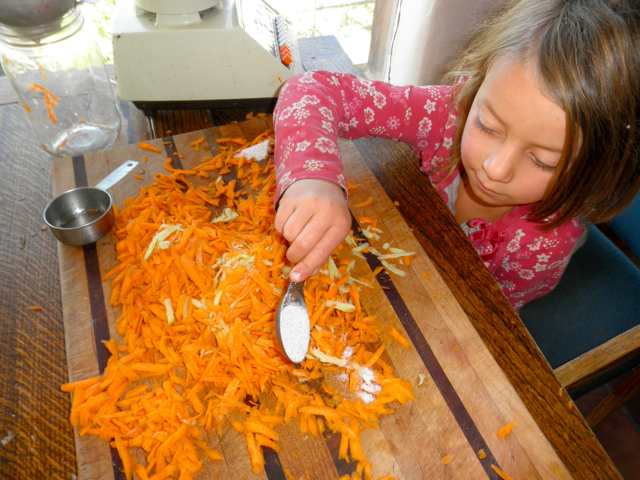 This is a great way to get ferments into your family’s diet. Also, thanks Rachel for helping me through it!! Hi! Looks delicious! I’m just wondering how careful you need to be with sterilization procedures and such when fermenting your veggies? Any advice? I’ve read lots of different recipes and some people say it is necessary and others don’t mention it. Mackenzie, I believe in hot soapy water. I made ginger carrots last week. Result was 1/2″ of pale gold color carrots at the top of the jar (they lost their orange color), when I opened it up after 4 days. No signs of mold or other spots. I scraped the light yellow layer off and covered again and put in the refrigerator too afraid to take a nibble. I also noted the “juice” in the bottle was very syrupy, viscose much like a raw egg white. The mixture does not have an unpleasant smell. Is this safe to eat? Is your liquid watery or elastic/slimy like mine? I really hate to throw this out but don’t want to make myself ill either! 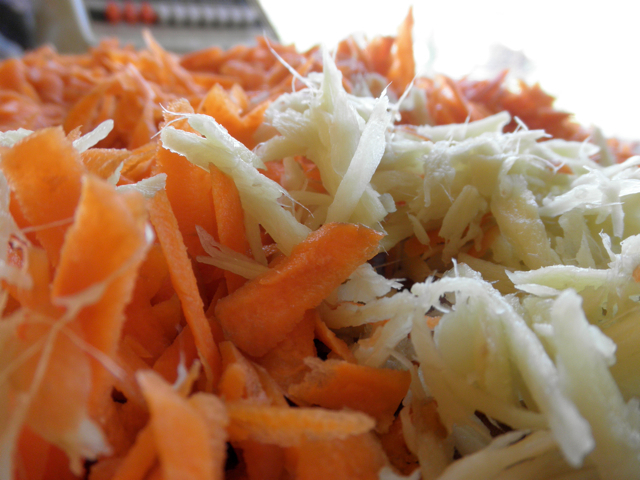 I used this recipe: 1/4 c whey, 1T salt, 1T grated ginger, 2# carrots grated fine (4 packed cups). It called for letting it sit for 3 days. 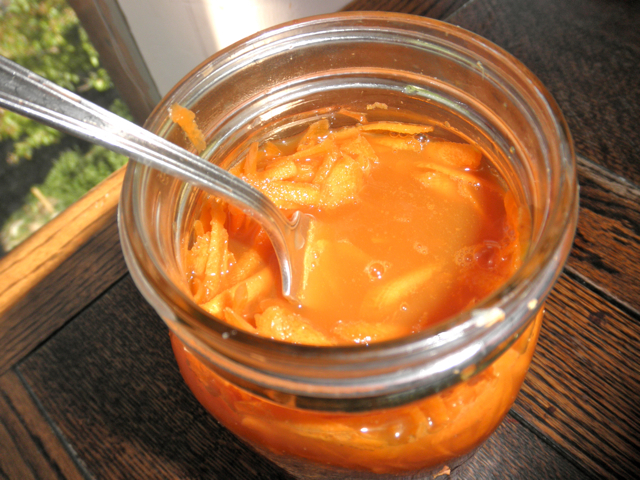 Pingback: Fermented Foods- What’s All the Fuss? | Vital Kids Medicine Blog! also will not offer a dramatic enough cinch to waist train with..